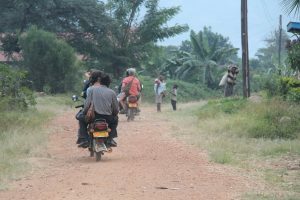 After an am azing, crazy week in Kampala we headed out to the rural Kasese District. Our heads and our hearts were already full with everyone we had met and the incredible work being done by women who would probably consider themselves ordinary Ugandans, but who in fact are pretty extraordinary Ugandans. They are not royalty, they are not politicians, they are not heads of major corporations; they are women quietly following their hearts and dreams and making a difference in the life of their neighbors, and all of us. As we made our way into the countryside the pace became slower and everything was green and lush. On the way we began to learn simple greetings in the native Lukonjo language; many of the children and men speak English but the women do not. 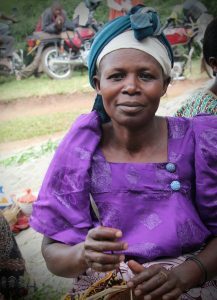 We are women who were on a trip to learn from women in Uganda; the ability to communicate was vitally important to us. 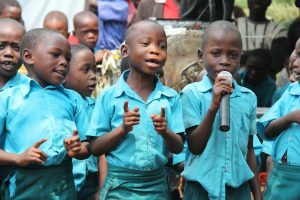 As soon as we arrived in Ibanda we were warmly welcomed by the staff and children of the Pride of Rwenzori Wagner Memorial School. It was a day of celebration for us all: six years of the school’s growth and Carrie reconnecting with friends. Carrie, Molly, Mandy, and I were invited to sing our national anthem as our flag was raised. There are no words to describe how we felt. Early the next morning we all met in the village center to ride up the mountain on the backs of boda-bodas (small motorcycles) to meet with women and a few men who are members of craft and coffee cooperatives. The first day we met with eight groups of between 8-10 members each. We were interested in how they are self-sustaining, and how we could potentially help in the future; this was a fact-finding trip and we knew we definitely did not have facts, or answers for them. What we discovered, I think, amazed us: every group has their own micro savings and loan system, some have been in place for decades. Each member pays an initial dues fee to join the group and they pay a pre-set amount on a regular basis. Loans are provided at 3% interest for a term of 3 months. If a member becomes sick or injured and cannot repay the loan on time the interest rate is dropped to 0% and the term is extended; clearly no usury here! 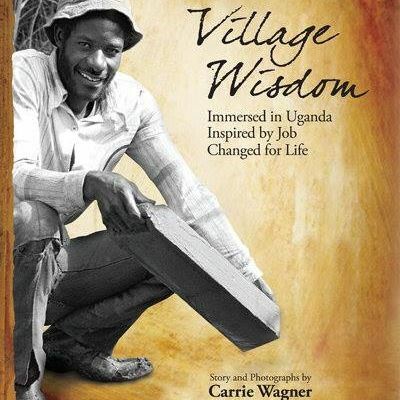 It is one of the beautiful ways villages are truly living in community. Members and neighbors look out for each other and no one’s disadvantage becomes another’s leg up. 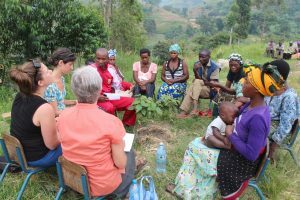 We were blessed to meet with even more groups in the villages of Ibanda and Maliba, women or their representatives totaling about 1800 individuals on the following days. Again, each group has a micro savings and loan system. Our hosts translated for us. The women we met are passionate about being able to keep their children in school, especially their daughters. They have learned that educating a daughter leads to a better life for everyone in the village. Women who weave were taught the skill by their mothers and grandmothers and they are passing the skills to their daughters and granddaughters. We learned that seamstresses typically rent their sewing machines and that roughly 3 months rent of a single machine could purchase the machine. They are entrepreneurs, business women, neighbors, and friends. They have hopes and dreams for the future and ideas about how to get there. We are blessed to have been in their presence, and look forward to a future of learning and sharing with these incredible women.